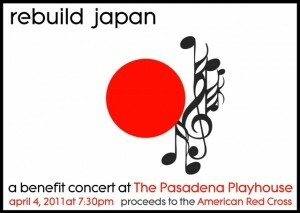 In response to the devastating events in Japan, producers Patty Onagan and Ronn Goswick have announced Rebuild Japan: A Benefit Concert at The Pasadena Playhouse, a one-night-only event on Monday, April 4 at 7:30pm. Proceeds will support the American Red Cross and its efforts to assist overseas as Japan begins to rebuild. A veritable who’s who of Los Angeles and Broadway theatre talent will be coming together to show their support, entertain, and help raise money to assist with Japan’s monumental crisis. The performers, in alphabetical order, include Erich Bergen (Jersey Boys/The Temperamentals), Doug Carpenter (Life Could Be A Dream/Camelot/Summer of Love), Davis Gaines (The Phantom of the Opera), Julie Garnye (Les Misérables), Adam Halpin (Rent/Glory Days), Cliffton Hall (Wicked), Deedee Magno Hall (Wicked), Alvin Ing (Flower Drum Song/Pacific Overtures), Dale Kristien (The Phantom of the Opera), Jodi Long (Flower Drum Song/Miss Saigon), Megan McGinnis (Dangerous Beauty/Daddy Long Legs), Adam Michaelson (Movin’ Out/Baby It’s You! ), Marc Oka (Flower Drum Song/Miss Saigon), Adam Pascal (Aida/Rent), Jennifer Paz (Miss Saigon/The Last Five Years), Valarie Pettiford (Fosse), James Snyder (Cry Baby/Dangerous Beauty), Gwen Stewart (Rent), Yuka Takara (Rent), Lea Thompson (Cabaret), Jennifer Leigh Warren (Little Shop of Horrors/Having It All), and the cast of Glory Days: Derek Klena, Matthew Koehler, Ian Littleworth, Jeffrey Scott Parsons, and Alex Martinez Wallace. All appearances are subject to availability. 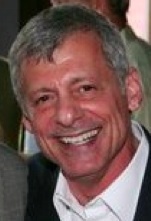 Said Pasadena Playhouse Artistic Director Sheldon Epps, “I have always found my fellow members of the theatre community to be enormously generous and always willing, ready, and eager to lend their great gifts to worthy causes, and especially to those who are suffering in extreme circumstances. This is proving to be true once again. It is a great honor for The Playhouse to participate in this tremendous effort by offering the use of our beautiful theatre in support of this benefit. I thank all of those who are participating, and all of those who will take advantage of this opportunity to aid those in need as a result of this devastating event. The evening will feature The Playhouse’s first ever mainstage cabaret seating concert. The mainstage will “extend” over the orchestra, seating an intimate 300 patrons. Tickets are $75 for cabaret seating (which also includes two drinks), and $30 for balcony seating. All tickets are sold as general admission. Pre-show activities begin at 6:30pm with a raffle (items donated by theatres and businesses all over Southern California), refreshments, and entertainment in The Engemann Family Courtyard in front of The Playhouse. 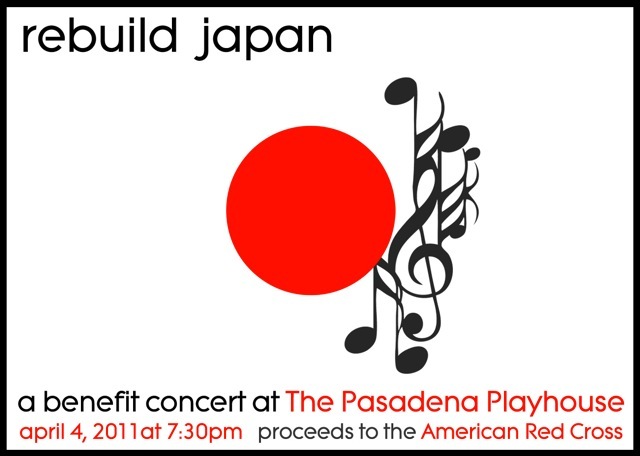 Rebuild Japan: A Benefit Concert at the Pasadena Playhouse will be directed by Meredith Greenburg, with Adam Michaelson, James May and Ron Abel serving as musical directors. Tickets can be purchased by calling (626) 356-7529, by visiting www.PasadenaPlayhouse.org, or in person at The Playhouse box office, located at 39 S. El Molino Avenue in Pasadena. Player King Productions, LA’s newest theatre company, has announced its inaugural production, Hamlet by William Shakespeare. Directed by Ty Mayberry, Hamlet will play one preview performance on Sunday, April 17 and is set to open at Gallery 1018 downtown on Monday, April 18 at 7:30pm. The engagement will run through Tuesday, May 10 only. A classic play set in modern times, Hamlet explores the struggle to find truth in a world of ambiguity and deception. Instructed to avenge his father’s death, the Danish Prince is soon consumed by his insecurities, and ultimately risks the fate of his family. This engaging production, performed in a non-traditional art gallery space, will allow audience members to hear the words of the play like never before. Hamlet is the most widely produced Shakespearean play. In spite of the nearly 400 years that have passed since it was first staged, Hamlet continues to intrigue and attract theatrical and literary audiences everywhere. The cast will feature (in alphabetical order) Samuel Dahl, Matt Freitas, Joshua Gray, Matthew Harris, Gina Lohman, Ken MacFarlane, TJ Marchbank, Joe Massingill, Angela Nicholas, Alexandra Oliver, Curtis Rainsberry, Jonathan Salisbury, and Jennings Turner. The set and lighting designs are by Danny Cistone, and the costume design is by Dori Quan. Alexandra Oliver is the production stage manager. Player King Productions is dedicated to bringing the “play” back to the theatre. It has been said, “We don’t stop playing because we grow older, we grow older because we stop playing.” Player King Productions aims to remind people of the days of play, when we let ourselves be guided by pure imagination and nothing else. PKP is committed to bringing the life back to theatre, and the theatre back to life. Hamlet has been a great passion of director Ty Mayberry’s since he played the title role for the Tony Award-winning Alley Theatre of Houston in 2003. He was a member of the resident acting company at the Alley for four seasons, and appeared in 21 productions, including As Bees In Honey Drown, Wit, A Midsummer Night’s Dream, The Devil’s Disciple, One Flew Over the Cuckoo’s Nest, the American premiere of Alan Ayckbourn’s House and Garden, and the 40th anniversary production of Who’s Afraid of Virginia Woolf? with Tony Award-winner Judith Ivey, among others. Located in the center of the downtown Los Angeles Art District, Gallery 1018, a converted industrial warehouse, is an extreme departure from a traditional theatre space. The gallery maintains its historic and gritty urban character while being completely retrofitted with facilities and amenities for a completely comfortable guest experience, along with all lighting and sound requirements for theatrical production. Seating will be in an intimate, modified round, with action taking place 360 degrees around each audience member. Hamlet will play one preview performance on Sunday, April 17 at 7:30pm and opening is set for Monday, April 18 at 7:30pm. The regular performance schedule is Sunday, Monday and Tuesday at 7:30pm through May 10 only. Ticket prices (all general admission) are $12 for the preview on 4/17, $18 on opening night, and $15 for the remainder of the engagement. To purchase tickets, visit www.brownpapertickets.com/event/166103 or reserve by phone at (310) 909-8629. For more information, visit www.playerkingproductions.com. Gallery 1018 is located at 1018 S. Santa Fe Avenue in downtown Los Angeles, 90021. Street parking is available, and Gallery 1018 is wheelchair accessible. At LA Web Fest (Michael Ajakwe, Founder) on Friday, March 25, McCracken Live!, a new web series created and produced by Brian Beacock and John Yelvington, was named an official selection for the upcoming Marseille Web Fest 2011. In addition, Beacock received an Outstanding Actor in a Mockumentary Series Award for his dual role of Tyler Hanson and Carol Ann McCracken. Written by Beacock and Yelvington, McCracken Live! features Tyler Hanson and his larger than life alter-ego, Carol Ann McCracken, as they struggle with new found success hosting a do-it-yourself television show. Balancing his broken marriage, meddling mother, detached son, and a frantic team of misfits who seem determined to kill him, Tyler finds out the hard way that renovating his life can be a real drag. Following its screening on Friday night, McCracken Live! was named one of the top nine by Jean-Michel Albert and Stephane Rizzo, producers and founders of Marseille Web Fest, Europe’s first all all-web series festival. Beacock and Yelvington will be flown to France for the festival, which will take place October 14-16, 2011 in Marseille. For more information on the series, visit www.mccrackenlive.com and/or the websites of the McCracken Live! distribution partners, www.koldcast.tv and www.minglemediatv.com.